Breed origin: Haflinger is a breed of horse developed in Austria and northern Italy (namely the South Tyrol region) during the late nineteenth century. The breed traces its ancestry to the Middle Ages; there are several theories for its origin. Haflingers, developed for use in mountainous terrain, are known for their hardiness. Their current conformation and appearance are the result of infusions of bloodlines from Arabian and various European breeds into the original native Tyrolean ponies.The foundation sire, 249 Folie, was born in 1874; by 1904 the first breeders’ cooperative was formed. All Haflingers can trace their lineage back to Folie through one of seven bloodlines. World Wars I and II, as well as the Great Depression, had a detrimental effect on the breed, and lower-quality animals were used at times to save the breed from extinction. During World War II, breeders focused on horses that were shorter and more draft-like, favored by the military for use as packhorses. The emphasis after the war shifted toward animals of increased refinement and height. In the postwar era, the Haflinger was indiscriminately crossed with other breeds and some observers feared the breed was in renewed danger of extinction. However, starting in 1946, breeders focused on producing purebred Haflingers and a closed stud book was created. Interest in the breed increased in other countries and between 1950 and 1974 the population grew, even while the overall European horse population decreased. Population numbers continued to increase steadily and as of 2005, almost 250,000 Haflingers existed worldwide. There are breeding farms in several countries, although most of the breeding stock still comes from Austria. 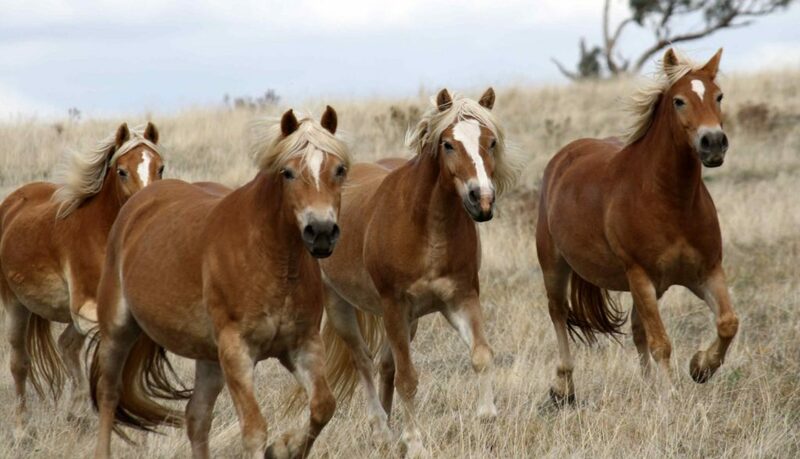 In 2003, a Haflinger became the first horse to be cloned, resulting in a filly named Prometea. Distinguishing features: Haflingers are always chestnut in colour and come in shades ranging from a light gold to a rich golden chestnut or liver hue. The mane and tail are white or flaxen. The height of the breed has increased since the end of World War II, when it stood an average of 13.3 hands. The desired height today is between 13.2 and 15 hands. The Haflinger has rhythmic, ground-covering gaits. The walk is relaxed but energetic. The trot and canter are elastic, energetic, and athletic with a natural tendency to be light on the forehand and balanced. One important consideration in breeding during the second half of the 20th century was temperament. A requirement for a quiet, kind nature has become part of official breed standards and is checked during official inspections. Some sources recognize two types of Haflinger, a shorter, heavier type used for draft work and a taller, lighter type used for pleasure riding, light driving and under-saddle competition. Modern day Haflinger: Today the breed is used in many activities that include draft and pack work, light harness and combined driving, and many under-saddle events, including western-style horse-show classes, trail and endurance riding, dressage, show jumping, vaulting, and therapeutic riding programs. They are used extensively as dressage horses for children, but are tall and sturdy enough to be suitable riding horses for adults. In the 1970s, British Prince Philip, Duke of Edinburgh competed with a driving team of four Haflingers. There are several national shows for Haflingers worldwide, including those in Germany, Great Britain and the United States.